We are a remarkable entity, engaged in offering a qualitative array of Precast Compound Wall. 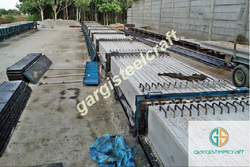 Owing to our in-depth knowledge in this domain, we are specialized in providing Concrete Precast Compound Wall. We are instrumental in offering a wide range of Precast Prestressed Compound Walls to our deemed patrons. The offered range of walls is constructed under the astute guidance of our qualified experts who work in close coordination to attain maximum level of client satisfaction. - Cobble stones (natural stone 4 x 4 x 4). like as per requirement. e.g Burner Blocks, Well Blocks, Flow Modulators, Darts, Dams, Baffles, Impact Pads, Lances, PCPF Block for Reheating Furnace etc. Precast Retaining Walls are extremely convenient to install and erect. We have manufactured and installed various different shapes and sizes of retaining walls till now and they are now a standard product in nearly all of our projects. We also produce compound wall panels. Our range of Precast Concrete Compound Walls is highly popular nowadays. Easy to make, this range is available in various sizes and shapes and known for its dimensional accuracy. Various machines are required in manufacturing this range that ensures durability and reliability. Moreover, this range acquires less space. We are offering Ready Made Compound Walls.